Do you want to build your own business? Would you like to start a part time business that eventually replaces your full time job? And do you want a proven plan for start a side business that earns big. 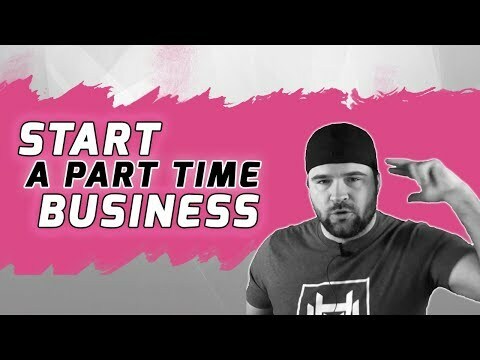 In this video I breakdown the 7 steps to start a part time business while working a job and how to turn your part time business into a full-time business so that you can quit your job. Plus, I share with you some great part time business ideas you can start now and start earning with! If you follow the proven plan inside this video I firmly believe you can build a great part time business that turns into your full-time business so you can quit your job and spend more time doing the things you love. Step 1. Start a part time business that will replace your living income the fastest. Service based business are great for this. Examples: Content creation, web design, social media management, SEO, lead generation, graphic design, customer support. This will give you a job replacing income the fastest and you can productize and outsource or hire later to generate a passive income. Step 2. Schedule In Business Time. If you don’t schedule it and set aside time to work on your new business it won’t happen. Work at night once the kids go to bed, or after your evening activities. Wake up a couple hours early. You should work on your part time business everyday even if it’s only 30 minutes. Shoot for an hour or 2 per day. Step 3. Create a simple sales process. Be ready to take paying customers and don’t get fancy with it. You need a way to take money and sell your customers. Sending simple Paypal invoices and talking directly to prospects can be your sales process when you’re just getting started. You don’t need a fancy sales funnel or website to get started. You can simply network on Facebook and send a Paypal link to those that are ready to buy. Sales, Sales, And Sales. Did I mention sales? In the beginning you need momentum. Revenue is momentum and will inspire you to push your side business even harder. Everything you do should be purposeful. Focus your efforts on getting clients and customers in the door. Things like putting content in front of your target audience that invites them for more, getting leads, prospecting, selling people, emails. 5. Use your existing network to land your first couple clients or customers. Who do you know that you can reach out to and make connections with potential clients? Who on your Facebook friends list, former co-workers, neighbors, friends of friends is a potential customer? Get testimonials. Working for free isn’t fun but it can be the difference between building a successful business or not. If you’re struggling to land your first client offer your service for free in exchange for reviews/testimonials. This will show potential customers you do good work and you’ve actually done what you’re trying to sell them on. 7. Give it everything you have and then some. Look the most successful business people got to where they are by putting in the work, consistency, and constant improvement. Put your head down, and push.